The first domestic Al compilation. The compact disc debut of the song "Ricky." All of the songs on this album were singles except "Addicted To Spuds." Above: The LP jacket and original CD insert (pic) featured badly photographed pictures from videos of some of the songs appearing on the album. When the title was reissued in 1991, the video photos were removed from the packaging. This page was last updated September 8, 2006. 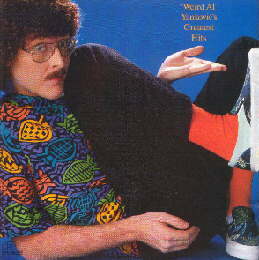 "Weird Al" Yankovic's Greatest Hits ©1988, 1990 Scotti Bros. Records. ©1999 Way Moby/Volcano Entertainment III. Personnel and recording studio information according to Permanent Record: Al In The Box and respective studio album liner notes. Recording dates, Billboard chart, and additional personnel information available at Weirdal.com, compiled by Jon "Bermuda" Schwartz. Most release dates according to the Library of Congress.